On the hundredth ann iversary of some women finally being given the right to vote, and the year that a statue to Millicent Fawcett has appeared in Parliament Square, the Sarah Siddons Fan Club have turned their attention to the story of suffrage in Southampton. In 1912 Southampton was seen as such a hotbed of support for Votes for Women that it was specifically targeted by the Anti-Suffrage brigade. 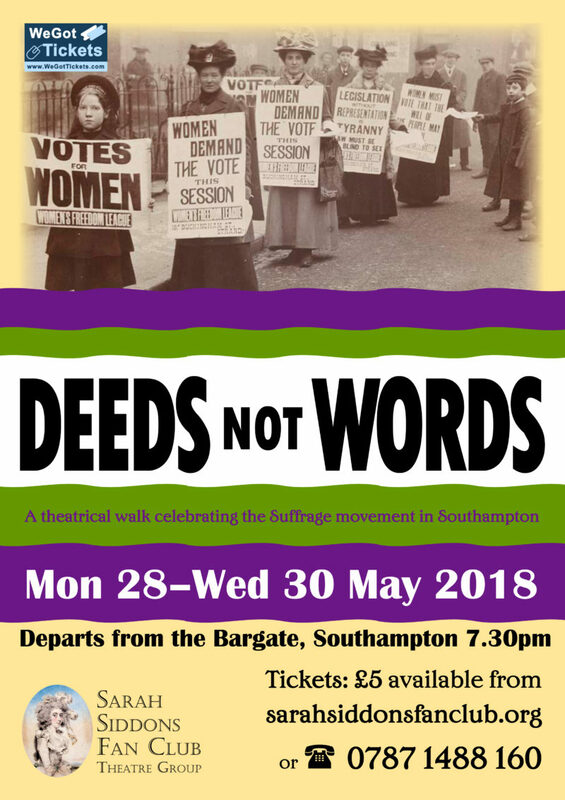 Join us for a march through the streets of Southampton and meet the local women, Suffragettes and Suffragists, hunger strikers, and pavement artists. Learn about the importance of bicycles, short skirts and small hats and how the fight was finally won. The performance begins at what was the original Southampton Guildhall in 1912, the Bargate, and ends near the home of Southampton’s first female mayor, a noted Suffragette and Suffragist and surely a women who also deserves a statue! We are presenting our theatrical perambulation Deeds not Words on Monday 28th-Wednesday 30th May each evening beginning at 7.30pm. All tickets are just £5 and available online at www.wegottickets.com/sarahsiddonsfanclub or direct from the Fan Club email: info@sarahsiddonsfanclub.org or phone 07871 488160.